The PharmD curriculum, Inquire, Innovate, Involve (I3) takes an innovative approach to education by structuring classes in modules so students can experience the integration of science and practice. I3 allows students to get hands-on pharmacy training earlier in the program and develops the interpersonal skills that are critical to patient interactions. The curriculum focuses on helping students develop a comprehensive problem-solving approach through increased incorporation of active learning strategies, integration of pharmaceutical and clinical sciences, and earlier introduction of integrated practical experiences that could be simulated and then practiced. In year one of our graduate program (P1), students start with a module that helps them make the transition into professional school. Next steps include receiving training in the basics of pharmacy law and a foundation in the administrative and management sciences of the practice of pharmacy. Students learn skills in providing patient care, such as counseling patients, administering immunizations, and taking blood pressures. They will practice these skills and more in an integrated patient care laboratory where they get direct feedback and coaching from pharmacists. Throughout the year, students will spend time in community pharmacies with a pharmacist preceptor, practicing the skills they learn through the curriculum. The academic year ends with an assessment of each student’s proficiency of skills and knowledge. During the summer, students complete a 40 hour immersion experience where they apply the skills, knowledge and attitudes they developed in their first academic year. The second and third years of the program (P2 and P3) afford students the opportunity to continue to develop and practice skills that are critical to becoming an exemplary pharmacy practitioner. These two years include a four course sequence where students learn how the pharmaceutical sciences integrate with clinical sciences and how this relates to the treatment of patients. Students also take a four-course sequence designed to teach them how to advance collaboration and quality of patient care by providing interprofessional opportunities for students to learn about, from, and with other members of the healthcare team. At the end of the second and third years there are comprehensive assessments of knowledge and skills. The summer between the second and third years include a 40 hour immersion experience in an institutional pharmacy setting. 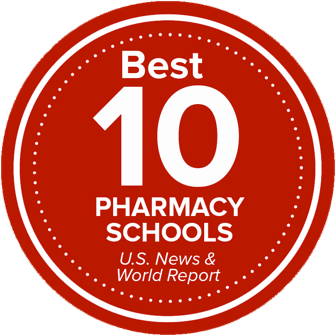 The fourth and final year of the PharmD program (P4) includes nine one month rotations in multiple pharmacy practice settings. These rotations are called Advanced Pharmacy Practice Experiences (APPE), and enable students to hone and improve their skills to become exemplary patient care providers. The Transitions sequence of courses will provide students with essential skills and tools for successful matriculation and progression through the professional PharmD curriculum. The courses emphasize development and assessment of interpersonal skills such as professionalism, self- awareness, leadership, and entrepreneurship and innovation. Strategies and resources for wellness are also highlighted and reinforced. This module will provide students with an introduction to the U.S. healthcare system, management, leadership, and pharmacy law, in the context of preparing them for their roles as pharmacy interns and future pharmacy practitioners. The concepts covered in this module will forwardly integrate with selected pharmacy practice topics in future modules (e.g. IPCAL, IPPE), as well as more advanced topics in the Foundations in Pharmacy Administration 2 (FiPA-2) module in the P3 year. As much as possible, this course will involve the use of active learning strategies that are focused on helping students to apply what they have learned through pre-class preparation, in-class lectures and activities, and individual study. The first and second courses in a series of authentic, hands-on experiences that enable students to master component skills that are essential for exemplary patient care. Students will practiceintegration of these patient care skills in simulated practice settings. Topics include pharmacy calculations, community pharmacy dispensing, communication, Top 200 drugs, drug information in the community setting, and non-sterile compounding. This is a two-semester sequence of part-time experiences that enhance and complement first-year professional coursework. The experiential education team works in cooperation with faculty teaching didactic courses (especially Concepts in Patient Care and the Integrated Patient Care Lab). Students engage in activities in community pharmacies and with other pharmacy partners. Activities are planned to provide a foundation for attitudes and skills that will be applied during the progression of professional experiences in Introductory Pharmacy Practice Experience (P2 and P3 years) and full- time, Advanced Pharmacy Practice Experiences (APPE Sequence). A series of courses addressing concepts and skills that are essential components of exemplary patient care. This module focuses on oral and written communication, as well as drug information skills in using the patient care process to counsel patients on the selection and use of nonprescription medications, most especially in community and ambulatory care pharmacy settings. Materials will be delivered via lectures, small group activities, and case-based discussions. This module provides basic foundations in the pharmaceutical sciences necessary for the understanding of drugs and determinants of physical chemistry of pharmaceutical products, medicinal chemistry and pharmacokinetics. This module assesses student performance on the program-level ability based outcomes as well as demonstrating that students are achieving outcomes required by specialized accreditor the Accreditation Council for Pharmacy Education (ACPE). The second year series of courses addressing concepts and skills that are essential components of exemplary patient care. This course focuses on communication and drug information skills in the context of understanding and utilizing the patient care process. Communication and drug information skills will be discussed and applied in the context of community, institutional, ambulatory care pharmacy practice as well as other settings. The first half of a four-course sequence designed to teach PharmD students pathophysiology, pharmacology, and pharmacotherapy using an integrated approach. This approach facilitates the development of a rigorous understanding of the scientific basis for preventing and managing human health disorders, and the ability to integrate and apply that knowledge while providing exemplary medication-related patient-centered and population-based care. The courses in the Integrated Pharmacotherapy Sequence are organized into modules that are typically based on an organ system (e.g., the “cardiovascular diseases module”), and each module is organized by disease state (e.g., “hypertension”). IP1 consists of a series of modules on the cardiovascular, renal, and endocrine systems, and the disorders that affect those systems. IP2 consists of modules on immunology, the pulmonary system, infectious disease, gastrointestinal and genitourinary systems. Consideration of each disease state begins with the pathophysiology of the disease, continues with pharmacology of the drugs used to treat the disease, and ends with how those drugs are used in patients to achieve optimal therapeutic outcomes. The third course in a series of authentic, hands-on experiences that enable students to master component skills that are essential for exemplary patient care. Students will practice integration of these patient care skills in simulated practice settings. Topics include sterile compounding, IV order verification, electronic health records, communication with healthcare providers, drug information in the institutional setting, and other skills related to institutional practice. Students will also continue to develop skills introduced earlier in the IPCaL sequence, including but not limited to communication with patients, Top 200 prescription drugs, and prescription verification. The fourth course in a series of authentic, hands-on experiences that enable students to master component skills that are essential for exemplary patient care. Students will practice integration of these patient care skills in simulated practice settings. Topics include disease state management, comprehensive medication review, patient education, drug information in the ambulatory setting, documentation and other skills related to ambulatory care practice. Students will also continue to develop skills introduced earlier in the IPCaL sequence, including but not limited to communication with patients, Top 200 prescription drugs, and prescription verification. The first half of a four-course sequence designed to teach PharmD students how to advance collaboration and quality of patient care by providing interprofessional opportunities for students to learn about, from, and with other members of the healthcare team. This required course will have three interactive collaborations per semester with at least one other healthcare discipline present at each time. Students choose from an authorized list of elective courses both within the college and within the university to explore and expand areas of interest. The fifth part in a series of courses addressing concepts and skills that are essential components of exemplary patient care. This course focuses on advancing professional practice skills and concepts related to nonprescription products and integrative medicine practices. This module will build on patient care process, communication, and drug information concepts from previous courses to ensure students are able to apply concepts and skills necessary to assist patients with self-care decisions and provide pertinent patient counseling about common nonprescription medications and integrative therapies. The second half of a four-course sequence designed to teach PharmD students pathophysiology, pharmacology, and pharmacotherapy using an integrated approach. This approach facilitates the development of a rigorous understanding of the scientific basis for preventing and managing human health disorders, and the ability to integrate and apply that knowledge while providing exemplary medication-related patient-centered and population-based care. The courses in the Integrated Pharmacotherapy Sequence are organized into modules that are typically based on an organ and each module is organized by disease state. IP3 consists of modules on neurological/psychological disease states, musculo-skeletal systems, and infectious disease. IP 4 consists of modules on oncology, hematology, and special populations. Consideration of each disease state begins with the pathophysiology of the disease, continues with the pharmacology of the drugs used to treat the disease, and ends with how those drugs are used in patients to achieve optimal therapeutic outcomes. The fifth and sixth courses in a series of authentic, hands-on experiences that enable students to master component skills that are essential for exemplary patient care. Students will practice integration of these patient care skills in simulated practice settings. Topics include synthesis of skills learned throughout the IPCaL sequence and other coursework to provide comprehensive patient care within complex scenarios. Patient care simulations will focus on preparation for Advanced Pharmacy Practice Experience (APPE) rotations. The second half of the four course sequence designed to teach PharmD students how to advance collaboration and quality of patient care by providing interprofessional opportunities for students to learn about, from, and with other members of the healthcare team. The module presents advanced topics in pharmacy administration including management, the healthcare system and pharmacy law. Advanced pharmacy practice experience rotations including ambulatory, community, institutional and elective settings. Students may receive Honors Level Performance distinction and have a textual note added to their official University transcript. Independent study activities related to advanced pharmacy practice experiences.